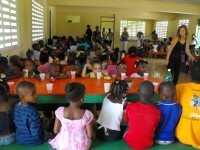 Having spent a day introducing the 26 teachers from 15 different ministries to the Kids' EE program they all took part in the Scripture Fun Fair. 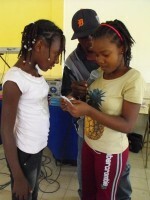 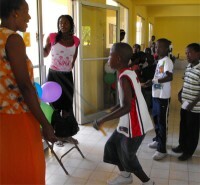 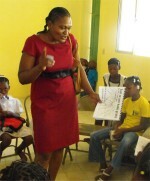 As over 150 children from the Heart for Haiti Children's Village and school filled the Communication Centre for a day filled with fun and activity. 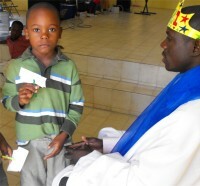 The Scripture Fun Fair was immediately followed by the Gospel Presentation using the Farley Cards (an excellent visual aid) to bring the Salvation message to the children. 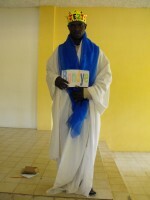 Many gave their lives to Jesus. 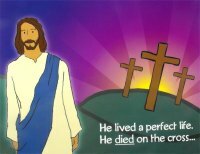 Twenty teachers were present and able to share the Gospel using the Farley Cards. 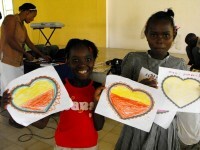 Special thanks to Heart for Haiti that have offered this excellent facility free of cost for us to host this Kids' EE teacher training summer camp. 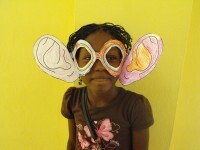 The children quickly learned that they have two ears and only one mouth because they are to listen twice as much as they talk! 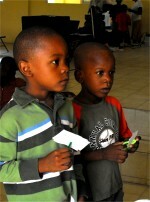 They discovered that we wanted to get to know them better and were eager and excited to take part in the Kids' EE Interview. 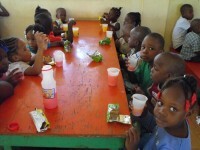 Praise God a donation enabled Heart for Haiti to provide juice and 'candies' mid morning and this was received with great excitement! 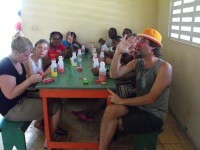 Special thanks to the Dutch team that helped out by taking the 'little ones' from 5 years and under and a great time was had by all! 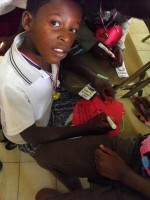 The children were great at the 'Take home Truths' and seen here making their two questions bracelets. 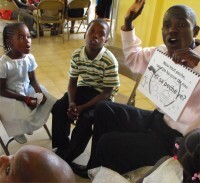 This is the the first step towards starting a conversation with their friends that could lead them to leading them to Jesus. 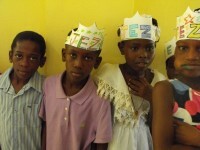 They learned about Grace being a free gift and got actively involved in the skits and drama. 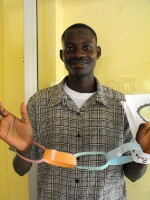 Even the teachers had fun making the 'sin paper chain' as the children learned that the wages of sin is death but the gift of God is eternal life. 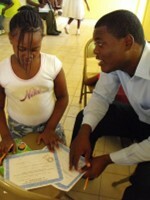 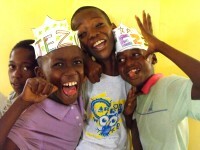 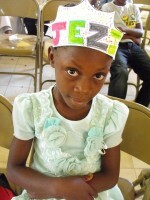 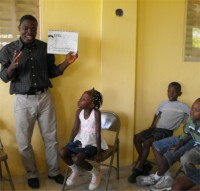 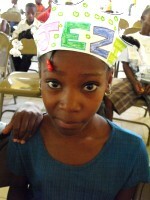 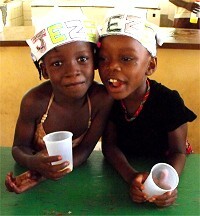 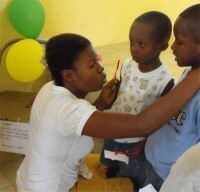 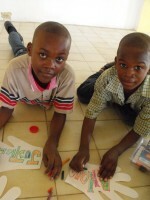 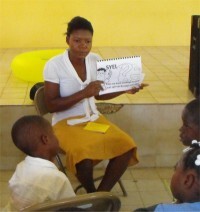 Learning Bible verses became easy and fun as the children played games and created crafts associated with the verses. 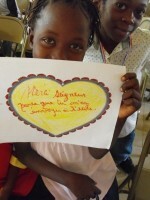 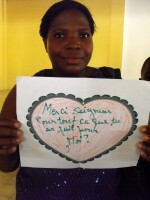 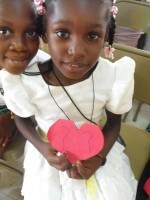 The hearts were enjoyed especially by the girls who made 'Thank you God...hearts'. 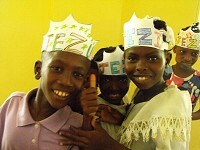 The children and teachers found things to thank God for and were delighted to pose for the pictures. 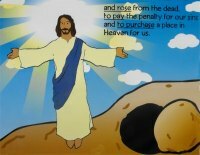 The children learned the 'Gospel in a Nutshell' and were excited about practicing the Salvation message with their friends. 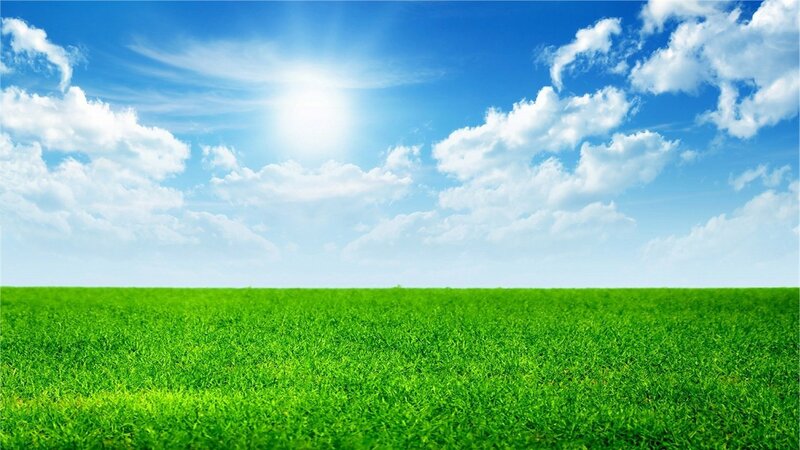 a place in Heaven for us. 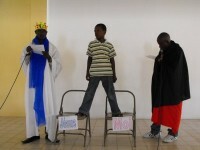 Dramas and skits were used to bring across a very serious message. 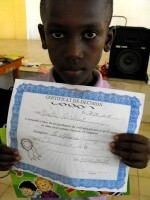 This little boy had to make a decision he could no longer live with one foot in the church and one in the world. 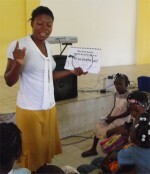 In fact he was not the only one as many children responded to the alter call and came to give their lives to Jesus. 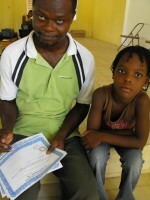 The new converts were taken by the teachers who prayed with them and filled out their certificates. 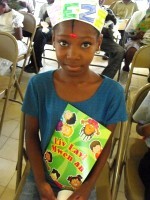 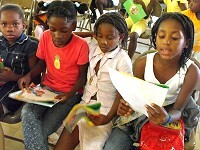 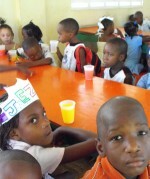 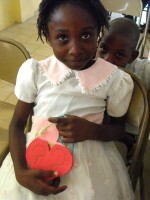 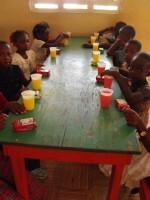 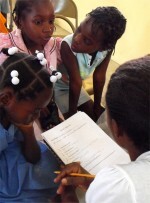 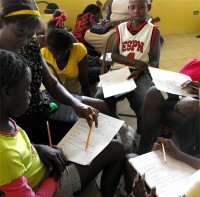 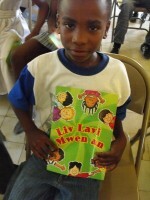 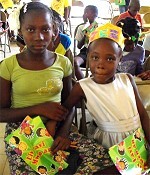 We are believing God to be able to supply Creole Bibles to these children. 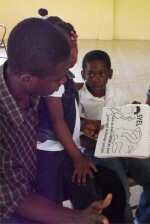 Special thanks to Mr. Owen Williams from the Bible Society of the Eastern Caribbean based in Barbados that arranged for us to receive these wonderful books from the Bible Society of Haiti. 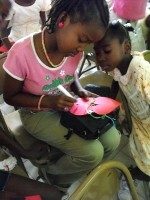 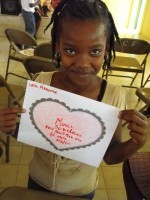 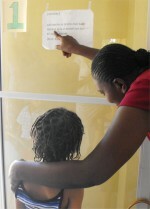 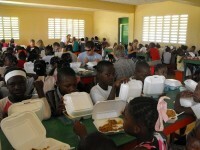 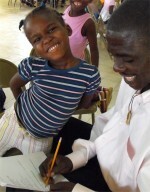 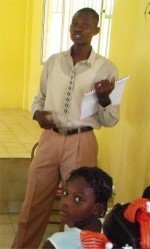 What a wonderful job they are doing in Haiti. 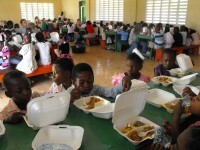 As always eating was a highlight of the day and the food was great thanks Heart for Haiti for enabling us to have a wonderful camp in your excellent facilities.